Winchester is a great place to explore over the festive period, especially for a day or long weekend. Here are 5 reasons why we think Winchester is the perfect place to visit this Christmas. Starting on the 1st December we’ll be offering an exciting festive three course Christmas lunch at Rick Stein, Winchester to get you in the Christmas spirit. On the menu expect some of Rick’s new dishes from his latest Long Weekends book including beetroot-cured gravlax with apple and cucumber pickle and Icelandic breaded lamb chops with spiced red cabbage. You’ll also get to choose from a selection of Rick’s favourite desserts including rice pudding with spiced pineapple, chocolate pavé and marmalade cheesecake with blood orange granita. 2016 marks the 10th anniversary of the Winchester Cathedral Christmas market. Attracting over 350,000 visitors each year, the market is known for being one of the best in Europe, making it a must-visit destination over the festive period. On arrival, you’ll see over 100 wooden chalets full of Christmas goodies like mince pies, mulled wine, some of Hampshire’s finest cheese as well as handmade crafted gifts. The market is open between Friday 18th November to Tuesday 20th December. Known for being one of the best ice skating rinks in the country, Winchester’s ice rink is a perfect playground for both adults and children this November. 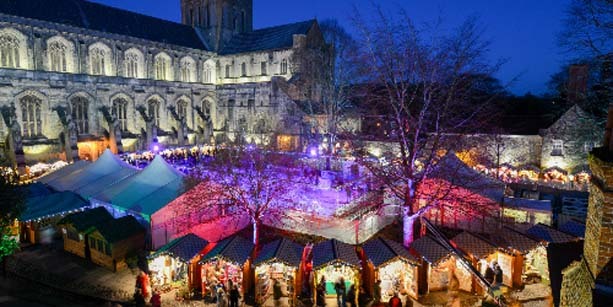 The ice rink is situated with a lovely dramatic medieval architecture as a backdrop and comes into its own in the evening when the Winchester Cathedral is lit up. This year visitors will be treated to a new 595 square metre clear roof, guaranteeing skaters a rain-free session whatever the weather. The ice rink is open between the 18th November to 2nd January. For a full list of times and prices visit here. The wonderful Winchester Christmas light switch on is a great way to start the Christmas festivities. Watch the Winchester High Street light up as over 25,000 sparkling white lights are turned on, transforming the high street and creating a magical display. With food and drink also available on the evening, this is a great activity suitable for the whole family. The lights switch on will take place on the 17th November between 4pm to 8pm. Watch a beautiful procession of Christmas lanterns parade through the city of Winchester. Homemade paper and willow lanterns will light up the night sky in a stunning display and a congregation of carol singers led by Churches Together Winchester, will bring the cathedral grounds to life. A fantastic firework display will then conclude the evening festivities. The lantern procession will take place on the 1st December at 6pm, starting at Winchester Cathedral. For more information on how to take part in this year’s procession click here.